Rain, freezing rain, sleet and snow…..all part of a wintry mix in store for the Ozarks from Friday into Saturday. The National Weather Service says a Winter Weather Advisory is in effect for the KTTS listening area from Friday morning through Saturday night at midnight. Areas north and east of here have a Winter Storm Watch kicks starting Friday. It’s for the Lake of the Ozarks and south central Missouri, where four to seven inches of snow are possible. 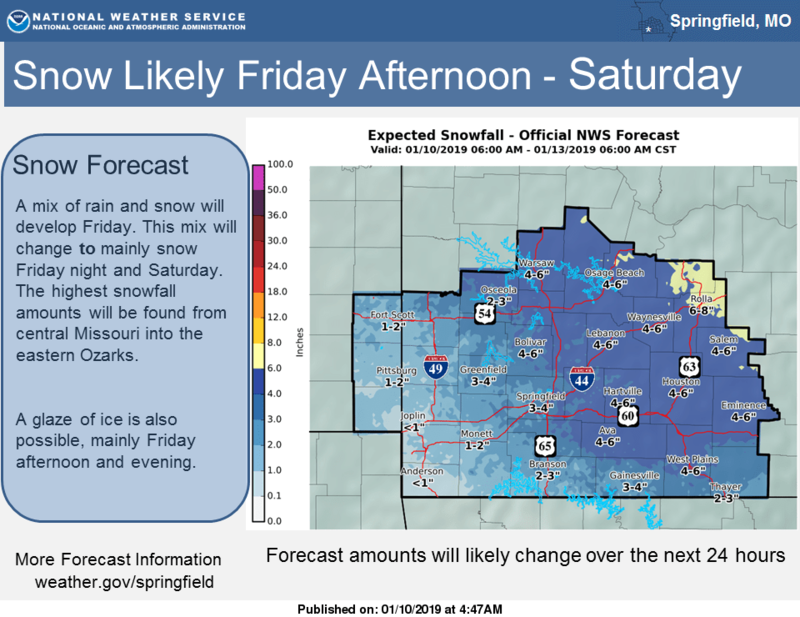 Two to four inches of snow are expected from Truman Lake down through the Springfield metro area to around Bull Shoals Lake, with a dusting to two inches along Interstate 49 in western Missouri. In addition, forecasters say a think glaze of ice will be possible along and south of a line from Cassville to Willard up to Conway and back down to Eminence. The National Weather Service cautions snowfall amounts will likely change over the next 24 hours as the storm system comes ashore in the western U.S. Thursday.